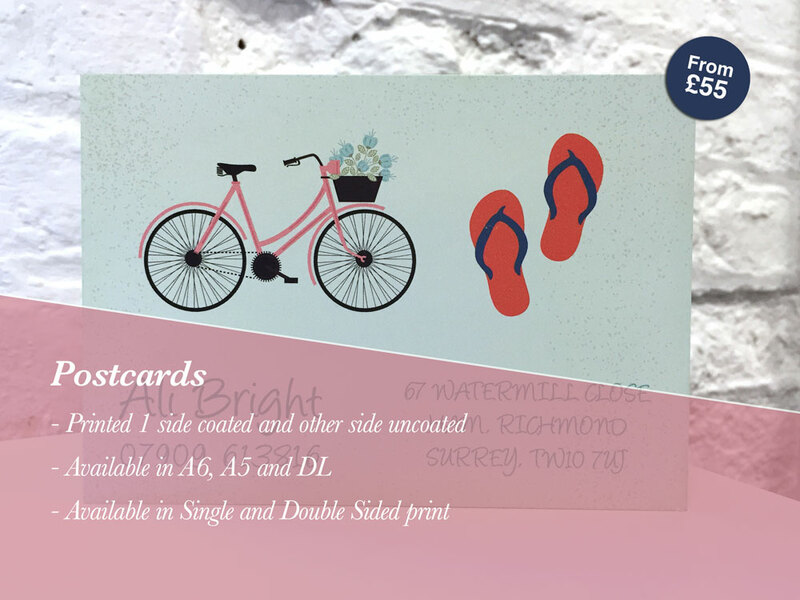 Our postcards are just like the ones you get at the seaside! Printed on 300gsm Chromo Board which has one coated side and one uncoated side, making them perfect for both displaying photos and writing on! As a standard, our postcards are printed in A6, A5 and DL sizes. Postcards are great for elegant invitations, save the date cards, wedding invitations, best wishes cards and direct marketing or used as inserts in brochures and magazines. Postcards can be printed both single and double sided. As with everything from Leeds Printing Company, standard delivery anywhere in the UK is FREE. We also offer a SAME DAY DELIVERY SERVICE on certain items for a small fee. Delivery time for Postcards are 3-4 working days for orders placed by 16.30 with print-ready artwork. Why not order some Letterheads also? Prices below for double sided, full colour postcards printed on 300gsm Chromoboard. Price includes VAT. Prices above are for double sided / full colour postcards. Standard delivery time is 3-4 working days for orders placed by 16.30 complete with print-ready artwork. Price includes VAT. We use a 300gsm Chromoboard for our postcards. This means 1 side is coated for the image and the other side is uncoated to write on.